A barbershop for a man is like a salon for a woman. It’s a place to relax, socialize and be pampered (in a very manly way). A place where a man can get a haircut, a close shave and a good dose of guy talk. Best of all, it can be a meaningful experience shared between father and son creating memories to last a lifetime. What little boy doesn’t love spending special guy time with his dad? 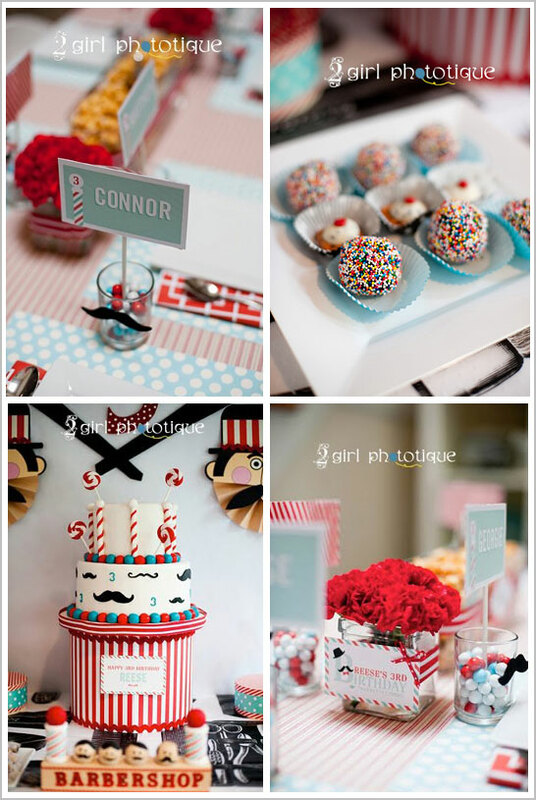 Dawn Menon of Bee*s Knees Parties drew upon this concept to create the most charming third birthday party for her son. Inspired by Reese’s love of the barbershop, Dawn incorporated everything from the classic red and white stripes to barber poles, scissors and swirly mustaches. 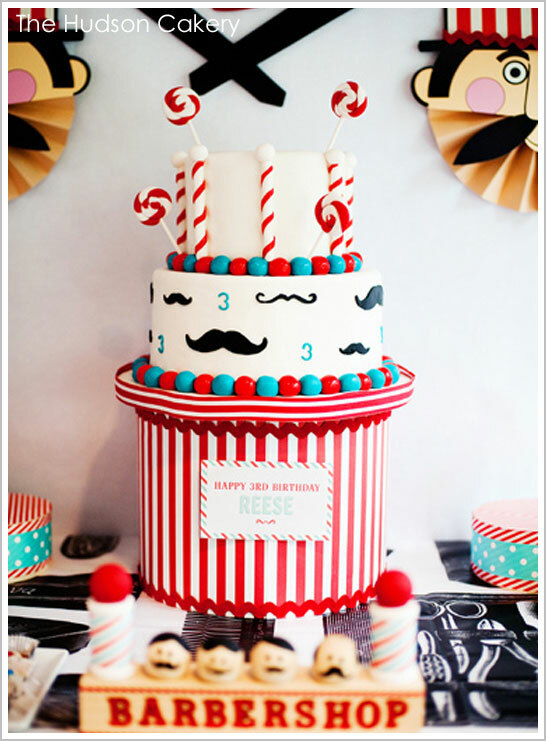 Featuring an adorable cake by The Hudson Cakery, this delightfully vintage Barbershop Birthday Party is a modern throwback to the golden age of barbershops. “When it came time to choose a cake design, I was excited to give Jennifer of The Hudson Cakery complete autonomy of concept and design. One of my client’s had The Hudson Cakery create a cake for their daughter’s Communion, and the cake was talked about for days after, so I knew my guests were in for a treat. We are all smiles too! Love the concept, love the decor, love the cake!! 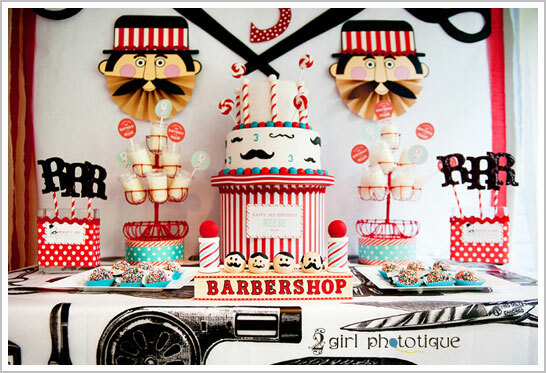 A very special thank you to Dawn of Bee*s Knees Parties for sharing her delightful Barbershop Birthday Party with us! I love unique party themes and this is def a first! Love all the deets, especially that cake! I love the details on this cake! 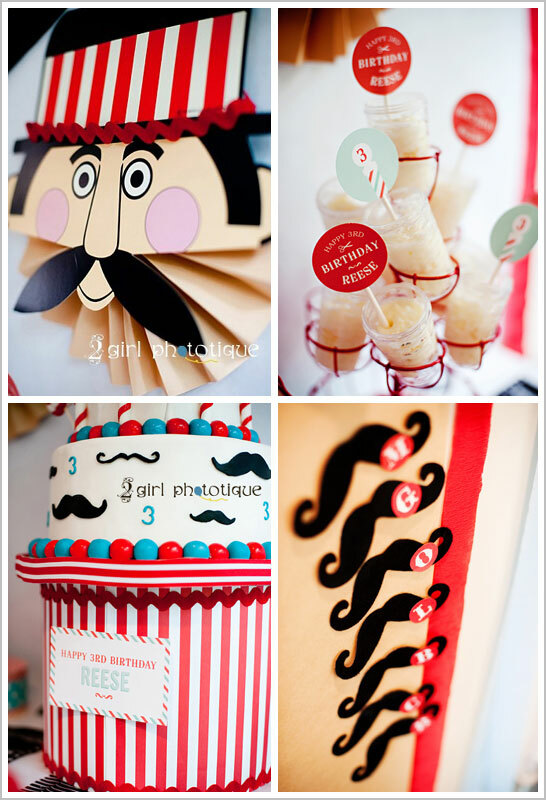 Those cute little mustaches and those barber poles are to die for!! This is so lovely! She did a GREAT job! This is such a cute idea! I love thinking out of the box! This party is just incredible!! 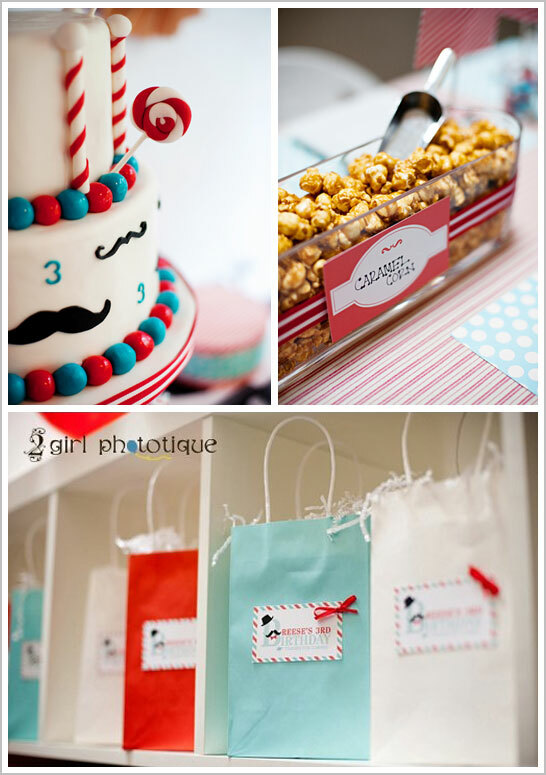 Cute party theme and the cake is adorable. I absolutely love love this theme!! So original!! Awesome job!! I love the cake! What a fabulous party theme! Awesome designs! So much fun, and so bold! That is CRAZY CUTE. I am contuing to love discovering the many many fun blog posts on Half-Baked! This Party is AMAZING !!!!!! Can you tell me where I can get the Barber Faces you used please. What a beautiful and original party!! Love it! Can you please share where your got the tablecloths and the paper barbers hanging on the wall? Would love to replicate. Awesome job! I, too, would love to know where you got the tablecloth and paper barber faces. Thanks!